King Dave holds tight to his sceptre and takes us all to Sunday school. If there's been a recent campaign by music critics to take Bad Plus/Happy Apple drummer Dave King down a peg, I didn't get the memo. I've Been Ringing You, his first album with his new trio featuring pianist Bill Carrothers and bassist Billy Peterson, has been trumpeted as something that will "silence critics." 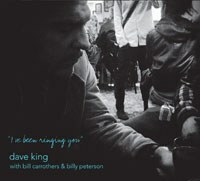 With at least half-a-dozen albums apiece from his progressive jazz bands the Bad Plus and Happy Apple in addition to the two albums he already had under his own name, I thought Dave King had nothing left to prove. Well, limitations are sometimes in the eye of the musician and King wants us all to know that he's capable of deep ballads while being as minimal as possible. King, Carrothers and Peterson did not rehearse for this session, one that lasted for just a few hours inside a church. They glide through many a standard with Ornette Coleman's "Lonley Woman" missing so many notes from its melody you may not recognize it. Perhaps it's the sanctuary recording space, but King's trio snags an ambiance in the open air unknown to many a jazz piano trio. I've Been Ringing You Is recommended not as a tool for the defensive but as a new shade for the old standards; better than your first or second listen.